Christmas Ornaments make great Christmas gifts. Specify your Christmas design and personal message. Personalized Christmas Ornaments are things remembered for years to come. Engraved mirrored ornaments reflect the lights of tree and are simply beautiful. This sweet little angel Christmas ornament is adorable. Mirrored Glass Christmas Ornaments make great Christmas gifts. Select your favorite design and personalize the Christmas Ornament with your special message. Many people like to engrave a person's name and the year on the Christmas ornament. Also consider using a special Bible scripture reference or favorite saying. These Christmas ornaments are laser engraved on the back of the ornament for a truely beautiful effect. The mirrored ornaments come with a silver ribbon in a white gift box with a clear front. You can put up to 3 lines of engraving with no more than 15 characters per line on the ornament. A block font is normally used since it can be easily read. Octogon Christmas Ornament - 2-1/2" x 3-1/4" x 1/8"
This beautiful angel Christmas ornament is blowing her trumpet. Mirrored Glass Christmas Ornaments make great Christmas gifts. Select your favorite design and personalize the Christmas Ornament with your special message. Many people like to engrave a person's name and the year on the Christmas ornament. Also consider using a special Bible scripture reference or favorite saying. These Christmas ornaments are laser engraved on the back of the ornament for a truely beautiful effect. The mirrored ornaments come with a silver ribbon in a white gift box with a clear front. You can put up to 3 lines of engraving with no more than 15 characters per line on the ornament. A block font is normally used since it can be easily read. This pretty little ballerina Christmas ornament has a stetched octogon shape. Mirrored Glass Christmas Ornaments make great Christmas gifts. Select your favorite design and personalize the Christmas Ornament with your special message. Many people like to engrave a person's name and the year on the Christmas ornament. Also consider using a special Bible scripture reference or favorite saying. These Christmas ornaments are laser engraved on the back of the ornament for a truely beautiful effect. The mirrored ornaments come with a silver ribbon in a white gift box with a clear front. You can put up to 3 lines of engraving with no more than 15 characters per line on the ornament. A block font is normally used since it can be easily read. This mirrored Christmas ornament has a pretty Christmas bell design on a stetched octogon shape. Mirrored Glass Christmas Ornaments make great Christmas gifts. Select your favorite design and personalize the Christmas Ornament with your special message. Many people like to engrave a person's name and the year on the Christmas ornament. Also consider using a special Bible scripture reference or favorite saying. These Christmas ornaments are laser engraved on the back of the ornament for a truely beautiful effect. The mirrored ornaments come with a silver ribbon in a white gift box with a clear front. You can put up to 3 lines of engraving with no more than 15 characters per line on the ornament. A block font is normally used since it can be easily read. These dual Christmas bells are great for couples and mirrored glass Christmas Ornaments always make great Christmas gifts. Select your favorite design and personalize the Christmas Ornament with your special message. Many people like to engrave a person's name and the year on the Christmas ornament. Also consider using a special Bible scripture reference or favorite saying. These Christmas ornaments are laser engraved on the back of the ornament for a truely beautiful effect. The mirrored ornaments come with a silver ribbon in a white gift box with a clear front. You can put up to 3 lines of engraving with no more than 15 characters per line on the ornament. A block font is normally used since it can be easily read. The candle Christmas ornament is a great idea for those that help shine the light. Mirrored Glass Christmas Ornaments make great Christmas gifts. Select your favorite design and personalize the Christmas Ornament with your special message. Many people like to engrave a person's name and the year on the Christmas ornament. Also consider using a special Bible scripture reference or favorite saying. These Christmas ornaments are laser engraved on the back of the ornament for a truely beautiful effect. The mirrored ornaments come with a silver ribbon in a white gift box with a clear front. You can put up to 3 lines of engraving with no more than 15 characters per line on the ornament. A block font is normally used since it can be easily read. The Candy Cane is a great idea for the sweet people on you Christmas List. Mirrored Glass Christmas Ornaments make great Christmas gifts. Select your favorite design and personalize the Christmas Ornament with your special message. Many people like to engrave a person's name and the year on the Christmas ornament. Also consider using a special Bible scripture reference or favorite saying. These Christmas ornaments are laser engraved on the back of the ornament for a truely beautiful effect. The mirrored ornaments come with a silver ribbon in a white gift box with a clear front. You can put up to 3 lines of engraving with no more than 15 characters per line on the ornament. A block font is normally used since it can be easily read. This Christian ornament design has a cross in the center of a window with praying hands. Mirrored Glass Christmas Ornaments make great Christmas gifts. Select your favorite design and personalize the Christmas Ornament with your special message. Many people like to engrave a person's name and the year on the Christmas ornament. Also consider using a special Bible scripture reference or favorite saying. These Christmas ornaments are laser engraved on the back of the ornament for a truely beautiful effect. The mirrored ornaments come with a silver ribbon in a white gift box with a clear front. You can put up to 3 lines of engraving with no more than 15 characters per line on the ornament. A block font is normally used since it can be easily read. This traditional Chritmas tree design makes a cute Christmas ornament. Mirrored Glass Christmas Ornaments make great Christmas gifts. Select your favorite design and personalize the Christmas Ornament with your special message. Many people like to engrave a person's name and the year on the Christmas ornament. Also consider using a special Bible scripture reference or favorite saying. These Christmas ornaments are laser engraved on the back of the ornament for a truely beautiful effect. The mirrored ornaments come with a silver ribbon in a white gift box with a clear front. You can put up to 3 lines of engraving with no more than 15 characters per line on the ornament. A block font is normally used since it can be easily read. This cute little Christmas tree makes an adorable Christmas Ornament. Mirrored Glass Christmas Ornaments make great Christmas gifts. 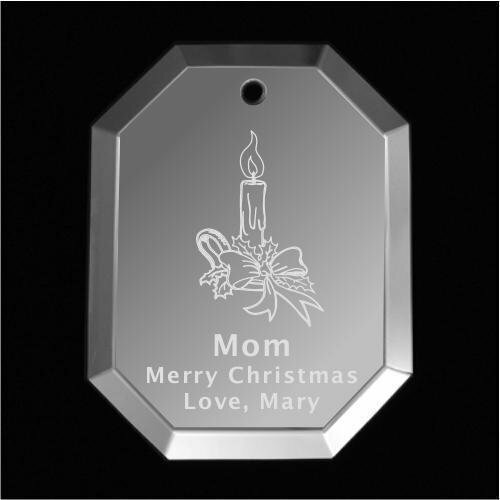 Select your favorite design and personalize the Christmas Ornament with your special message. Many people like to engrave a person's name and the year on the Christmas ornament. Also consider using a special Bible scripture reference or favorite saying. These Christmas ornaments are laser engraved on the back of the ornament for a truely beautiful effect. The mirrored ornaments come with a silver ribbon in a white gift box with a clear front. You can put up to 3 lines of engraving with no more than 15 characters per line on the ornament. A block font is normally used since it can be easily read.